This week is one of those stretches where everything seems to be going on at once in the world of sports. Playoffs in the National Basketball Association and the National Hockey League, the world hockey championship and the announcement of World Cup rosters have all garnered headlines in sports sections across the country. 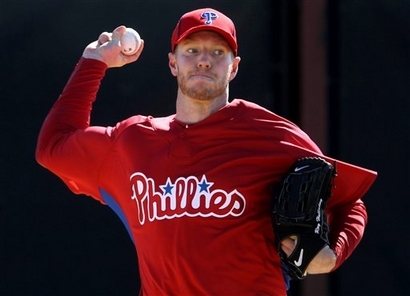 But one piece of news was sure to rankle Canadian sports fans more than the rest – Roy Halladay’s return to the Rogers Centre in late June has been relocated to Philadelphia. The series was supposed to be a homecoming for the former Jay who is now anchoring the Phillies' rotation. However, because of a security perimeter set up around the Metro Toronto Convention Centre for the G-20 Summit, Halladay won’t be returning to his old stomping grounds until at least 2011. That is when the Jays and Phillies will next face each other in inter-league play. Although this year’s series will now be held in Citizens Bank Park, the Blue Jays will still be the home team of record, with the American League’s designated hitter rule in effect and Toronto still getting to hit at the bottom of the inning. “We would have been bringing people down into an area where people aren’t being asked to come to,” said Blue Jays president and chief operating officer Paul Beeston. Although safety concerns should be a primary concern of the Toronto franchise’s front office, they could have handled this situation better. After all, American League rules won’t protect the Blue Jays from Philadelphia’s notoriously obnoxious hecklers. Having the last at bats of the game won’t mitigate the fatigue of travel. It really isn’t an ideal alternative. The Phillies will also be seeing some kind of profit margin from this change of scenery. Although Beeston insists the endeavour will probably be revenue neutral, I find it hard to believe that the Jays wouldn’t have benefited from a temporary boost in attendance figures. It would also have been cathartic for a beleaguered Toronto fan base that is still reeling from the loss of Halladay, arguably the greatest player in franchise history. A better idea would’ve been to put the series at PNC Park, home of the Pittsburgh Pirates. It would still be some distance for Toronto fans to travel, but it would also have been a long drive for the Phillies and their supporters. Pirates fans would be just as likely to root against their Pennsylvanian rivals as they would be to boo the Blue Jays, so it would eliminate Philadelphia’s home-field fan advantage. Another logical choice would have been Coca Cola Field, home of the Triple-A Buffalo Bisons. Even closer to Toronto than Pittsburgh, the park has a capacity of 18,025. That’s not up to Major League Baseball’s usual standards, but it would definitely be big enough to hold Toronto’s average crowd of 15,207. Again, the New York state crowd would be just as apt to heckle the Phillies as they would the Blue Jays. The move to Philadelphia’s Citizens Bank Park is yet another failure by the Toronto Blue Jays front office to show any kind of respect for its fan base. They could have done better. Done more than just shrug and brush off any concerns at a press conference. Moving from the Rogers Centre for the duration of the G-20 summit was necessary, but it seems like they put little thought into viable alternatives. Beeston and company have mishandled the situation and done their supporters a disservice. To be fair, we don’t know the status of PNC Park during that series. Even if it wasn’t hosting a Pirates series it may be hosting other events. Same with the Bison’s stadium. Assuming the financials are in the Jays favour (i.e. they get the concessions revenue etc.) then playing that series in Philadelphia makes the most sense on the economics. I agree that it is a PR nightmare, but that is likely mostly the result of the Halladay factor. Had this been an interleague game against, say those very same Pirates, I don’t think it would be as big a deal. In my opinion, the real villains in all of this are the protesters at the G-20. Not the average, peaceful protesters mind you, but the professional agitators who exist merely to create violence and anarchy. I for one would round them up, put them in Rogers Centre and MAKE them watch an A’s-Pirates series…but that might be labeled torture.